Those that have Uranus in Aquarius tend to have a good intuition and have amazing ideas. They make loyal friends and like to help those in need. A lot can have an aptitude for mechanical skills. They can be a bit erratic and people can take advantage of them. They seem to be popular wherever they go. It was discovered 1781 by a man called Sir William Herschel. At first he thought it was a comet as it is too dim to be seen with the naked eye. However, several years later it was confirmed as a planet. Uranus takes 17 hours and 14 minutes to turn on its axis. It takes a long time to go around the Sun – 84 years in fact! 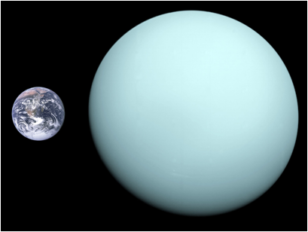 Uranus has the coldest weather and coldest temperatures of any of the planets. It is often called the Ice Giant. It has the fourth largest planetary mass in the Solar System. Its composition is said to be very similar to Neptune. It has a Radius of 25,362 km. It is 2.871 billion km from the Sun. It has 27 moons in various sizes all of which have names. It has no solid surface. It is known as a gas giant, but does differ in composition from Jupiter and Saturn. It has a hydrogen layer and helium is mixed in. Below it has rock and an ice core. The minimum atmospheric temperature is -224c.